24 Nights is the fifth live album by Eric Clapton, recorded at the Royal Albert Hall in London, England, in 1990 and 1991. It was released on 8 October 1991. The album is a "best of" from the 42 concerts Eric Clapton did at the Royal Albert Hall in those two years. Clapton set a record by playing a run of 24 nights at the London Royal Albert Hall between 5 February and 9 March 1991, following an 18-night run in 1990. 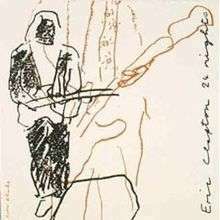 Clapton reportedly was not satisfied with the 1990 concert recordings and delayed the release of a CD until after the "24 Nights" of the 1991 dates. These concerts were performed with 4 different instrumental formations, 4-piece, blues, 9-piece and orchestra nights, the last featuring the National Philharmonic Orchestra conducted by Michael Kamen. The cover illustration is by Peter Blake. The 4-piece recordings "Running on Faith", "White Room" and "Sunshine of Your Love" included on the CD and DVD were recorded on 24 January 1990. The band consisted of Clapton with bassist Nathan East, drummer Steve Ferrone and keyboardist Greg Phillinganes. The Blues Band titles "Worried Life Blues", "Watch Yourself" and "Have You Ever Loved a Woman" Clapton recorded with Buddy Guy and Robert Cray were shot and recorded on 5 February 1990. The last of the 1990 live recording session took place on 9 February 1990 recording the Orchestra Night. "Bell Bottom Blues", "Hard Times" and "Edge of Darkness" were used on both the CD and video recording. On 10 February 1991, Clapton recorded "Badge" for the CD release. Eight days later the concert for "Pretending", "Bad Love", "Old Love" and "Wonderful Tonight" featuring the 9-piece band lineup took place. "No Alibis", "I Shot The Sheriff" and "Cocaine" had been released on various CD singles of "Wonderful Tonight" since. The versions of "Old Love", "Wonderful Tonight" and "Pretending" (2nd solo only) on the "24 Nights" video are different from their album counterparts, but they were not taken from the previous night's show. They may even have been taken the year before. 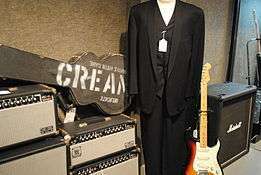 The song "Hoodoo Man" featuring Jimmie Vaughan was recorded on 28 February 1991. Clapton wore this custom-made Versace suit for the recording sessions in 1991. ↑ William Ruhlmann: 24 Nights Eric Clapton. Allmusic.com. Retrieved 2015-04-18. ↑ 24 Nights Album Review. Retrieved 2015-04-18. ↑ Eric Clapton - 24 Nights. Retrieved 2015-04-18. ↑ Pareles, J: Ever Solid and Reliable. Retrieved 2015-04-18. ↑ Christgau, R. Eric Clapton. Retrieved 2015-04-18. ↑ Floman, S: 24 Nights. Retrieved 2015-04-18. ↑ 24 Nights. Retrieved 2015-04-18. ↑ 24 Nights at Where's Eric! ↑ 1990 Eric Clapton Tour archive at Where's Eric! ↑ 1991 Eric Clapton Tour archive at Where's Eric! ↑ 28 February 1991 - Eric Clapton Tour archive at Where's Eric! ↑ "Australiancharts.com – Eric Clapton – 24 Nights". Hung Medien. Retrieved 30 January 2016. ↑ "The ARIA Report" (PDF). Australian Recording Industry Association. Australia: Pandora Archives (704): 19. 18 August 2003. Retrieved 30 January 2016. ↑ "Musik Video Top-10 UGE 32-2001". Hitlsten (in Danish). IFPI Danmark. Archived from the original on 30 January 2016. Retrieved 30 January 2016. ↑ "Dutchcharts.nl – Eric Clapton – 24 Nights" (in Dutch). Hung Medien. Retrieved 30 January 2016. ↑ "Longplay-Chartverfolgung at Musicline" (in German). Musicline.de. Phononet GmbH. Retrieved 30 January 2016. ↑ "Classifica settimanale WK 41 dal 2014-10-06 al 2014-10-12". Federazione Industria Musicale Italiana (in Italian). F.I.M.I. Retrieved 30 January 2016. ↑ "Charts.org.nz – Eric Clapton – 24 Nights". Hung Medien. Retrieved 30 January 2016. ↑ "Swisscharts.com – Eric Clapton – 24 Nights". Hung Medien. Retrieved 30 January 2016. ↑ "Eric Clapton | Artist | Official Charts". UK Albums Chart Retrieved 30 January 2016. ↑ "Eric Clapton – Chart history" Billboard 200 for Eric Clapton. Retrieved 30 January 2016. ↑ "Top Music Videos" (PDF). Billboard Magazine. Nielsen Business Media, Inc. 103 (51): 76. 21 December 1991. ISSN 0006-2510. Retrieved 30 January 2016. ↑ "Eric Clapton Brasil". Facebook. Retrieved 5 February 2016. ↑ "AMPROFON Gold Sales Award – "24 Nights"". Equipboard, Inc. Retrieved 5 February 2016. ↑ "ARIA Charts – Accreditations – 2004 DVDs". Australian Recording Industry Association. Retrieved December 15, 2015. ↑ "Canadian Sales Rocket Up" (PDF). Billboard Magazine. Nielsen Business Media, Inc. 103 (50). December 14, 1991. ISSN 0006-2510. Retrieved December 15, 2015.